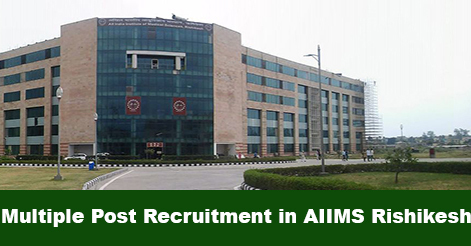 All India Institute of Medical Science (AIIMS), Rishikesh has released an advertisement for the recruitment in Staff Nurse, Medico Social Worker (MSW), Data Entry Operator (DEO) & Attendant on a contractual basis. These positions are under the project titled AIIMS Rishikesh and SEWA-THDC in Social Outreach Cell, AIIMS Rishikesh. Interested candidates may attend the walk-in Interview on 08th February 2019 at 09:00 AM. 2. Should be registered with the Indian Nursing Council/State Nursing Council. 1. Ability to use computers. 2. Hands on experience in office applications, spreadsheets and presentations. 1. Ability to use computers; Hands on experience in office applications, Microsoft Excel, spreadsheets and presentations. Master’s Degree in Statistics/Applied Statistics /Bio-Statistics from a recognized University. Interested candidates may attend the Walk-in-Interview for the above post on 08th Feb 2019 at 09:00 AM. Candidate must bring a completely filled application form (link given below). Help us to improve this article/job posting "Nurse, Attendant, DEO & MSW Recruitment in AIIMS Rishikesh". We would be glad if you can comment below and provide your valuable suggestions and feedback. If this page have any wrong information/list or out of context content, then you can report us as well. Dear sir I am DPharma holder can I participate in this post. or Workingg as a wealfear officer in company can I attend interview.